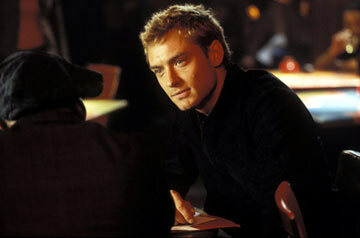 Jude Law is the new Alfie, reprising the role that garnered Michael Caine an Oscar nomination in 1966. This version of Alfie is structurally the same as the original, but the tone is much different. Law (I [Heart] Huckabees, Sky Captain and the World of Tomorrow) is much warmer than Caine was. Yes, Alfie is still a shallow womanizer, who rarely spends the night at his own apartment and dumps women every time any sort of commitment issue arises. But times have changed. Although people may still live a lifestyle like Alfie's, he seems much like a curious anachronism out of an earlier era. The subject of abortion is not as taboo as it was before (it's still plenty controversial), and issues like dating younger men or single mothers do not cause anybody to bat an eye. So Alfie is stuck in a curious mode. There really doesn't seem to be a purpose for this remake. While the acting is nice, watching Law play a shallow guy who begins to realize what kind of person he is is not that fun. Law addresses the camera directly, as if he is talking to the viewer. He leads everybody on a guided tour of his life, so anyone watching first hand can see exactly how he is feeling at any given moment. Thankfully, director Charles Shyer (The Affair of the Necklace, Father of the Bride Part II) does not have him go into first person in some of the more emotional moments. Still, the decision to have Alfie talk to the audience does not work. Alfie is charming, people get to watch him charm multiple ladies over the course of nearly two hours. Having Alfie break the fourth wall is a little too much, and while Law may be charming, the constant narration emphasizes how empty his life is. One can argue that this is the point of the Shyer and Elaine Pope's adaptation, but it is already obvious from watching Alfie. The film speeds through probably a half year of Alfie's life, where he begins encountering a series of emotional crises. A break-up with single mother Julie (Marisa Tomei, Anger Management, The Wild Thornberrys Movie) affects him more than he wants. When he decides to date steadily, the girl he chooses, Nikki (Sienna Miller, High Speed, Joy-Rider) only reinforce his earlier lifestyle. His best friend Marlon (Omar Epps, Against the Ropes, Big Trouble) and his girlfriend Lonette (Nia Long, Baadasssss!, Big Momma's House) are having problems, and Aflie's attempts to help end up making things worse. Things do look better when he meets Liz (Susan Sarandon, Shall We Dance, Moonlight Mile), a rich older woman who seems to enjoy the superficiality and physicality of their relationship as much as he does. So it all boils down to Alfie. He's handsome and slick, yet vain and self-absorbed. There are some plot machinations cause him to take stock in his life, but usually, after some minimal changes, he usually goes back to what he was before. Shyer and Law are able to bring some emotion into the last parts of the film, where Alfie feels that he really needs to rethink many of the aspects of his life, but because this has happened many times before, it feels like too little, too late. Yet, it is still fun watching Law go about his lothario ways. He has a nice chemistry with Sarandon, and Long, and watching Tomei quietly put him in his place is also nice. 1 hour, 40 minutes, Rated R for sexual content, and some language and drug use.